Every room at Solandra Villa has a view of the sea. There’s a pool at the villa, and when you want to explore, you can find golf and several shops nearby. Groceries and restaurants are only five minutes away by car, and guests of Solandra get access to a private cabana at the Sandy Lane Property Owners Beach Club. This villa works well for two couples and comes with four staff members including a cook, laundress, housekeeper, and gardener. 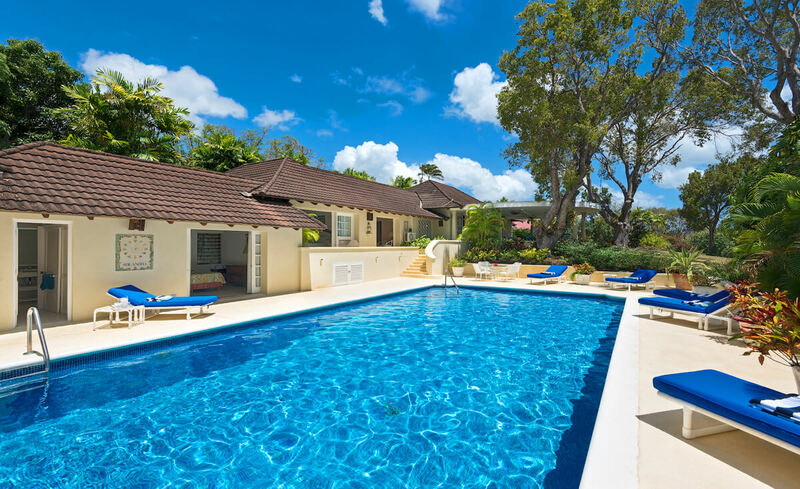 Solandra Villa is set within landscaped gardens and mahogany trees in the Sandy Lane Estate. This home is perfect for any family who wants to soak up sea breezes and ocean views. A multi-leveled deck leaves plenty of room for every guest. On the lower level, there’s a large lap pool surrounded by loungers, dining nooks, and potted plants. A short staircase leads up to the dining gazebo, which has unique light fixtures and garden views. There’s also a manicured lawn for playtime, picnics, and sunbathing. Sandy Lane’s golf course is a few steps from the pool, and the resort’s beach and private cabana are a short drive away. The elegantly decorated and spacious interior has high wooden ceilings, an open design, and nonstop views. The living and dining areas have contemporary furnishings, a U-shaped sectional, and a flatscreen TV. The gourmet kitchen is fully equipped with standard appliances, a wine rack, an extensive breakfast bar, a gas stove, and a prep island. Solandra’s three bedrooms are each air-conditioned and ensuite. Upstairs, there are two king suites with tubs and showers in the ensuite bathrooms. Downstairs, there’s a twin suite with two beds. Solandra is near the Platinum Coast, which is home to several restaurants, attractions, and water sports. A housekeeper, laundress, gardener, and cook maintain the villa. There is ongoing construction on the neighboring home which will be ongoing for the next 18-24 months. If you have any further questions concerning this property the ongoing construction feel free to call one of our villa specialists. Rental includes the use of a private cabana at the nearby Sandy Lane Property Owners Beach. Good for stays from Jan 29, 2019 to Jul 29, 2020.